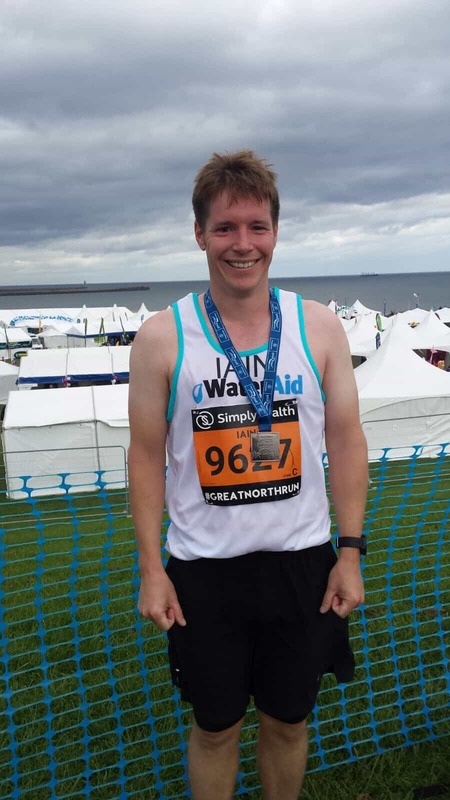 The Great North Run has been on my bucket list for many years. Just like the London Marathon, you wake up on a Sunday morning, make a cup of tea and switch on the TV to find its Great North Run day. You watch the coverage, get all inspired, swear that you will do it next year and then go for a run. This year, I held myself to it and did it. Most of the races I do are based around London, and I rarely have far to travel. This one took a little more planning and a little more travel. A hotel was required, as was 7 hours of driving. 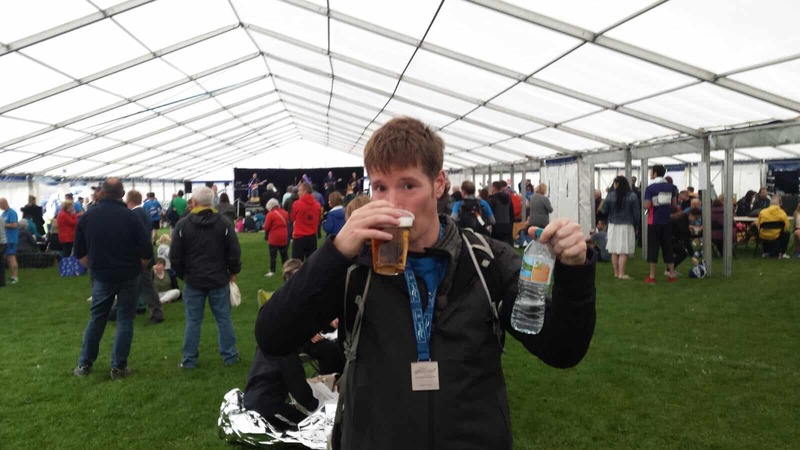 I didn’t get onto the hotel booking until a few months before (I’d known I would be doing this race for over a year, due to last year’s deferment). Obviously, there are a lot of runners and friends and family descending of Newcastle for the weekend and the hoteliers know it. The prices in the City centre are fairly steep. My girlfriend and I plumped for the City Centre, just for convenience, and it was the right option that saved a lot of messing around. 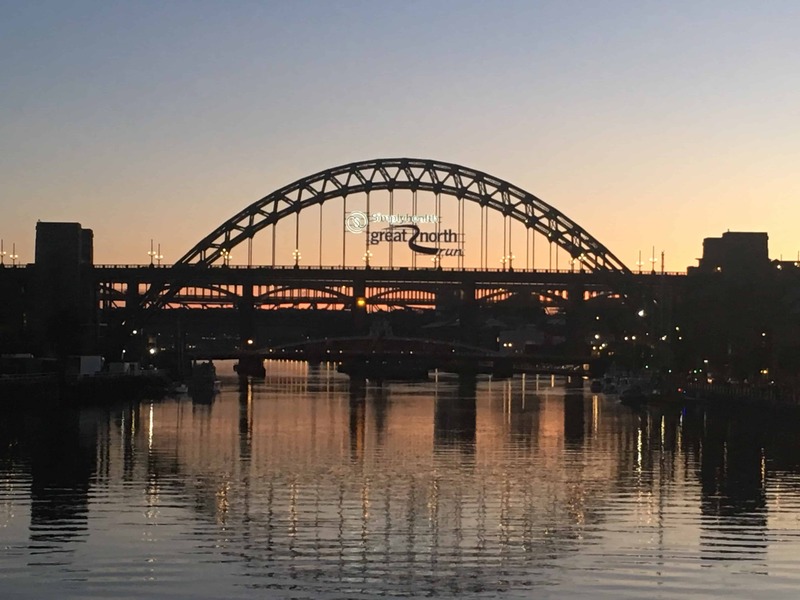 We arrived in Newcastle early Saturday evening and went for a stroll along the Quayside to see the Tyne Bridge and the Millennium Bridge and grabbed a bite to eat, before heading back to the hotel, prepping my kit and trying to get an early night. I tend to sleep like a log, but come the morning I couldn’t get back to sleep and was up early pottering around the room, whiling away the hours due to my excitement, until we could head out. Catching the news coverage on the BBC, people were obviously at the start from about 8 am onwards, but we headed out at 9.30am for the 20-minute walk to the start for a 10.40am gun. I sipped my coffee and necked my beetroot shot. I was super prepared for this race. I even took my own breakfast and pillows all the way to Newcastle. Marginal gains! The crowds grew on the walk and soon we were in what felt like a football crowd. The numbers were said to be 57,000 (although the Newcastle Chronicle puts the finishers at 43,000). The queues for the toilets looked horrendous. I was glad I didn’t have to go. I left my bag with my girlfriend and wandered down towards the start and squeezed into my pen (which was 3 from the front) with about 10 minutes to spare. Fair play to this guy! The gun went off and we crept towards the starting line. There was a part that narrowed before the start than then opened up 20m from the start line as to space runners out. Frustrating when queuing, but a nice relief once I was past and there was space. I hit my Garmin and set off. Oh, sh*t. I need a wee. Can I hold on? Nope! I hurdled a 2.5-foot Armco barrier and slipped into the trees on the side of the dual carriageway. Not the greatest of starts, but a good move as I could now concentrate and forget about it. I vaulted back over the barrier and was conscious of the time I have already lost. Surprisingly there is plenty of space, I stuck my head down and got motoring. The crowds close to the centre of town were deep as we rolled up and down the undulating dual carriageway. Before I knew it, I was crossing the Tyne Bridge. I took some of the atmosphere in and then focused on keeping my pace up. A couple of minutes later the Red Arrows flew over with cheers and claps from the crowd. I tagged on to a runner than seemed to be pretty serious and was going at a nice clip. The miles were clicking off at good splits and I have already made my toilet break time loss back. Action shot – on the far side. To the left of the man in black stood in the middle. In the white vest! To tell you the truth, most of the run was fairly uneventful. The route, though very functional and wide is not the most stunning. Pretty much lengths of dual carriageway with roundabouts in between. I did take a water bottle from Paralympic royalty in the form of Dame/Baroness Tanni Grey-Thompson. It was great to see she her out there. A member of the House of Lords getting involved and handing out water bottles. A super lady who also gave me a shout of “Go Iain”. I hadn’t bothered to take any gels with me. I hadn’t needed or used them during the last couple of halfs I’ve done. 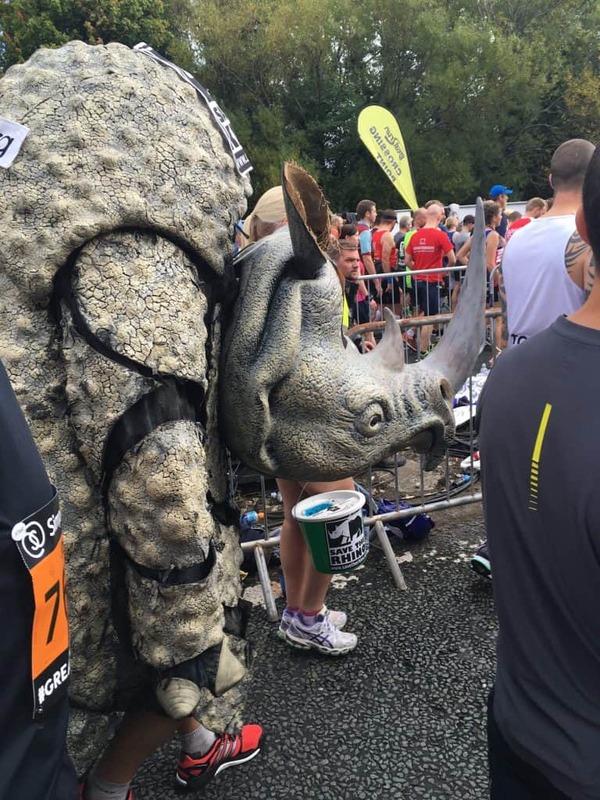 I was well fuelled but got the fear around mile 10. My pace was good, but what if I throw it all away due to my blood sugar falling? I grabbed a couple of jelly babies from a kind spectator and scoffed them down. They were not desperately useful. I struggled to breathe as I chewed and nearly choked on the second one. I ended up coughing it out on to the runner’s leg in front of me. 12 miles was up and the sharp downhill section to the coast was suddenly in front of me. It was not as long or as steep as it looks on TV. My miles splits were now hovering around 8 minutes. I turned left and picked up the pace. The crowds grew and grew and the noise got louder and louder. The crowd shouting my name spurred me on as I could see the 800m to go banner. For the briefest of moments, I wondered if I could get under 1.40, but there was still too far to go. I turned right, saw the finish line and gave it a final burst. All done. I had been aiming for sub 1:45. I wasn’t completely sure I had it in me, but my official time was 01:42:24 (Garmin time 01:42:25). I was over the moon, a new PB by about a minute. 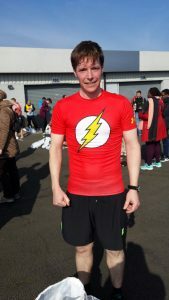 My previous PB had come a year ago at the Ealing Half where I felt I was in better shape than I am now. There, I died in the last miles. Here, I kept it steady with an average pace of 7:47 min/miles and although mile 12 was a struggle, I held it together. Obviously, stronger than I thought. I wobbled around and my quads instantly seized up (as they do). Then happily accepted my medal, goody bag and had my official photo taken. I met my girlfriend, pulled on some warm clothes and headed to the beer tent. Hmmm, I thought, this doesn’t seem very popular. We’ll have one and be on our way. I had forgotten, I was in an early wave, had no bag to collect, and did an all right time. From walking straight to the bar when I arrived, 30 minutes later there was a 20m queue and the place was packed. We enjoyed a few beers and chatted with other runners and then wander towards South Shields Metro station. 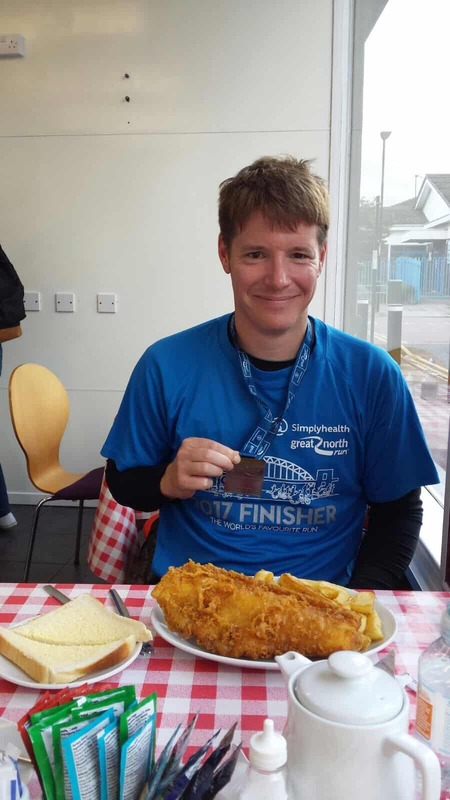 I had been hankering for Fish and Chips and we managed to snaffle a table for sit down Fish, Chips, Tea and bread and butter. Beautiful. We were obliviousness whilst enjoying our lunch to what was going on. Thousands of people streaming past us with only one way back to Newcastle. Upon making to the station we found there was a two-hour queue for the Metro. We’ll try the ferry. Two-hour wait there. Ubers were quoting £80. We ended up huddled at a local bus stop in the rain with 10 other runners who had no idea where they were going either. We finally got a local bus to a different metro line and made it back to Newcastle. I can’t blame the organisers about this. You are warned. I just didn’t know that the queues would be that long. It was rather annoying. When you are cold, wet and tired, you just want to get home and it was not that easy. There were plenty of people grumbling about the transport issues, saying it is the same every year and this would be their last year taking part. 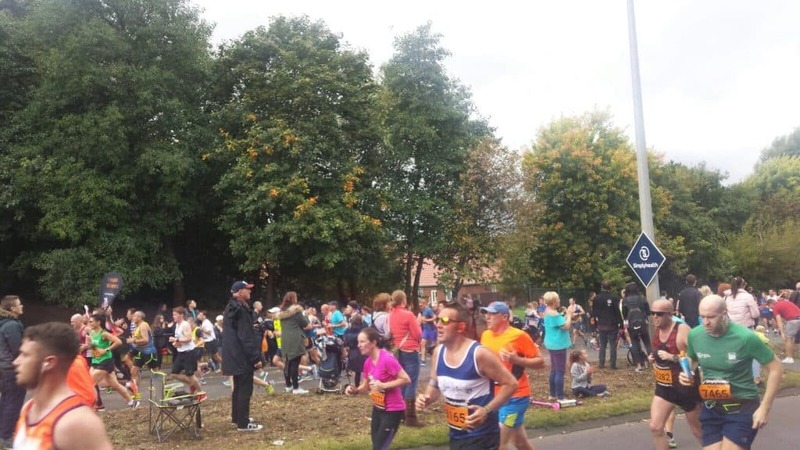 So the Great North Run in review, the atmosphere was good, the crowds were great, the route was uninspiring, the trip home was annoying, I love Newcastle and I got a PB. A great weekend away. 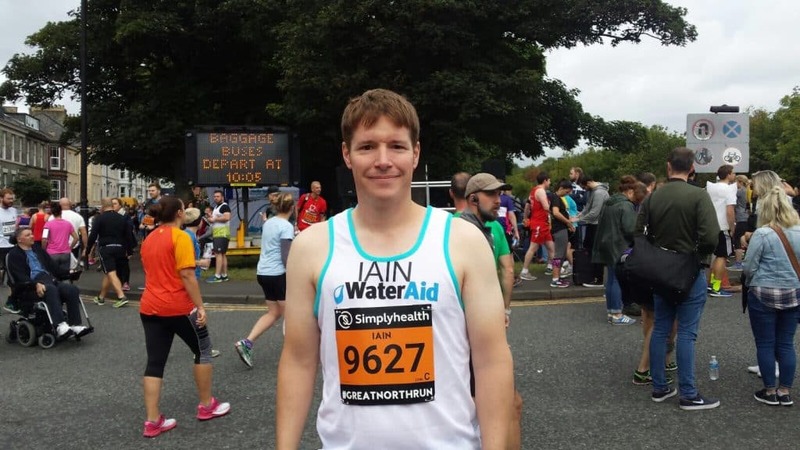 Would I do the Great North Run again? I’m not so sure. It was good, but I kind of felt just like a much bigger 10km race (but a half) that you would get elsewhere. There is nothing-particularly special about the race itself. Although, Newcastle is fantastic and well worth a visit. I will definitely be heading back.